Clarence H. Jay was born circa 1887 at Columbus, Franklin Co., Ohio.1,2 He was the son of D.W. Jay and Isabella P. Hollingsworth. Gail Arlene Gibb was born on 13 May 1955 at Canada.1 She married Michael Kenneth Harn, son of Kenneth Eugene Harn and Blanca Esther Oviedo, on 1 December 1973 at Chatsworth, Los Angeles Co., California.2,1 Gail Arlene Gibb and Michael Kenneth Harn were divorced on 28 July 1981 at Los Angeles Co., California. [S629] B. Esther (Oviedo) Harn, "E.B. Harn Sheets, FHL film 1036595, # 67", Feb 1977 (18921 Knapp St., Northridge, CA 91324). Hereinafter cited as "E.B. Harn Sheets, FHL film 1036595." Cameron Michael Harn is the son of Michael Kenneth Harn and Tafi Hernandez. Samuel Keefer married Elizabeth Douty, daughter of Otho Reynolds Douty and Sarah Anne Penn. [S796] B. Esther (Oviedo) Harn, "E.B. Harn Sheets, FHL film 1036595, # 217,218", Feb 1977 (18921 Knapp St., Northridge, CA 91324). Hereinafter cited as "E.B. Harn Sheets, FHL film 1036595." The South Bend Tribune Newspaper (Indiana), Wednesday 13 Jun 1956. The body of Andrew L. Shimp, 79, of 4346 N. Winchester St., Chicago, is at the Thallemer-Goethals Chapel where friends may call after 7 p.m. today. Mr. Shimp, a former resident of this city, died Sunday evening in his home after an illness of six years. He was born in Granger, Ind., and had lived in Chicago for 30 years. Shimp married Antoinette Linhard Nov. 15, 1899, in St. Joseph's Church in this city. He was the Chicago district manager of the Grissly Mfg. Corp., of Paulding, O. Surviving are his widow and two nieces. [S968] Unknown household, census, 35 North West Temple St., Salt Lake City, Salt Lake Co., Utah, Family History Library:. [S1876] SERVICES SET FOR A.L. SHIMP, The South Bend Tribune Newspaper (Indiana), South Bend, Indiana, 13 Jun 1956, n/a, The South Bend Tribune Newspaper (Indiana), Wednesday 13 Jun 1956. Hereinafter cited as The South Bend Tribune Newspaper (Indiana). [S967] Marriage Record Index, St Joseph Co , South Bend, Book 16 page 464, unknown repository, unknown repository address. [S1877] Mrs. Antoinette Shimp, The South Bend Tribune Newspaper (Indiana), South Bend, Indiana, 14 Jan 1960, n/a, The South Bend Tribune Newspaper (Indiana), Thursday 14 Jan 1960. Hereinafter cited as The South Bend Tribune Newspaper (Indiana). Source Citation: Year: 1880; Census Place: Harris, St Joseph, Indiana; Roll: 308; Family History Film: 1254308; Page: 291B; Enumeration District: 158; Image: 0720. Gertrude Shimp was born in 1871 at Indiana. He was the son of John M. Shimp and Sara Josephine Longley. Gertrude Shimp died on 13 July 1871 at Indiana. He was buried at Harris Prairie Cemetery, Granger, St. Joseph Co., Indiana. The cause of death was died when only 2-months old. History of St. Joseph Co., Indiana, 1880, page 716. History of St. Joseph Co., Indiana, 1906, page 1092. 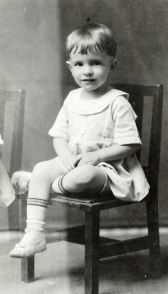 Donald Streeter at 2 years and 7 months. Donald Streeter was the son of David Herbert Streeter and Jessie Gertrude Harn. Donald Streeter died before 1911. The cause of death was died young. Not find Donald in the Birth or Death Records, Rice Co., MN. Britney Marie Ritenour is the daughter of James Leslie Ritenour and Teresa Maria Harn. [S969] Letter from Blanca Esther (Oviedo) McCulley (38454 Oak Tree Loop , Murrieta, CA) to Steven Harn Redman, 24 Jun 1992; Steven Harn Redman (2633 N. 1600 E., Layton, Davis Co., UT). SOURCE: Stella Squires letter 5/1991. SOURCE: Irene Vrzal letter 05Nov1992. Scott Alan Vrzal is the son of Stephen Arnold Vrzal and Christine M. Wondra. [S1674] MN Birth Index 1935-2002, online www.ancestry.com, 1977-MN-010371. Hereinafter cited as MN Birth Index 1935-2002. Martin Michael Vrzal is the son of Stephen Arnold Vrzal and Christine M. Wondra. [S1674] MN Birth Index 1935-2002, online www.ancestry.com, 1979-MN-021657. Hereinafter cited as MN Birth Index 1935-2002. Darrel Michael Kotek Jr. is the son of Darrel F. Kotek and Mary Jean Vrzal. [S1674] MN Birth Index 1935-2002, online www.ancestry.com, 1966-MN-028715. Hereinafter cited as MN Birth Index 1935-2002. Steven David Kotek is the son of Darrel F. Kotek and Mary Jean Vrzal. [S1674] MN Birth Index 1935-2002, online www.ancestry.com, 1968-MN-009010. Hereinafter cited as MN Birth Index 1935-2002. Kimberly Ann Kotek is the daughter of Darrel F. Kotek and Mary Jean Vrzal. [S1674] MN Birth Index 1935-2002, online www.ancestry.com, 1970-MN-027518. Hereinafter cited as MN Birth Index 1935-2002. Daniel Joseph Kotek is the son of Darrel F. Kotek and Mary Jean Vrzal. Kristy Jean Kotek is the daughter of Darrel F. Kotek and Mary Jean Vrzal. [S1674] MN Birth Index 1935-2002, online www.ancestry.com, 1976-MN-022356. Hereinafter cited as MN Birth Index 1935-2002. Jill Marie Connolly is the daughter of Dale Joseph Connolly and Barbara Beverly Vrzal. Thomas John Connolly is the son of Dale Joseph Connolly and Barbara Beverly Vrzal. [S1674] MN Birth Index 1935-2002, online www.ancestry.com, 1980-MN-042172. Hereinafter cited as MN Birth Index 1935-2002. Charles James Lawson is the son of Jerel Charles Lawson and Susan Ann Vrzal. [S1674] MN Birth Index 1935-2002, online www.ancestry.com, 1973-MN-012159. Hereinafter cited as MN Birth Index 1935-2002. Chad Michael Lawson is the son of Jerel Charles Lawson and Susan Ann Vrzal. [S1674] MN Birth Index 1935-2002, online www.ancestry.com, 1976-MN-007061. Hereinafter cited as MN Birth Index 1935-2002. Alexander Jacob Lawson is the son of Jerel Charles Lawson and Susan Ann Vrzal. [S1674] MN Birth Index 1935-2002, online www.ancestry.com, 1990-MN-049634. Hereinafter cited as MN Birth Index 1935-2002. Whitney Lauren Daleiden is the daughter of Timothy Michael Daleiden and Vickie Marie Vrzal. Justin Francis Daleiden is the son of Timothy Michael Daleiden and Vickie Marie Vrzal. Mary Faith Squires married Rodney Erickson. Mary Faith Squires is the daughter of Howard James Squires and Joyce H. Thielen. Leslie A. Squires is the daughter of Howard James Squires and Joyce H. Thielen.